Most adult dogs have 42 teeth and adult cats have 30 teeth in comparison to the 32 permanent teeth found in the typical human mouth. Generally around 14 to 16 weeks of age pet’s begin losing their front (incisor) teeth, with the others following in later months. The canine teeth usually fall out between four to six months of age. Cavities are rare in dogs, the bigger issue is probably periodontal disease with most dogs having some stage of this by the time they are two or three years old. 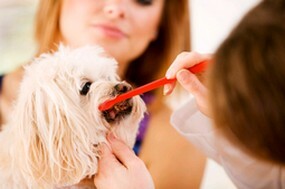 Oral disease is the most commonly diagnosed problem in small animal hospitals. Studies have shown that as many as 80% of dogs have signs of periodontal disease or gingivitis before the reach three years old. Bacteria and plaque can build up on dog teeth and gums causing dog bad breath and gingivitis without regular cleaning. What are worse those bacteria can get into your dog’s bloodstream and cause damage to the heart, lungs, liver and kidneys. If you haven’t done so for awhile or maybe never, it’s time to take a look at your dogs teeth; lift your dogs lips and take a look at their teeth and gums. If their teeth are more yellow than white and the gums are swollen or red these are signs of plaque and tartar buildup. If the gums are red or swollen this could be gingivitis or the beginning of severe periodontal disease. If left untreated this can lead to pain or tooth loss that can keep them from wanting to eat. Loss of appetite, excessive drooling, and loose teeth are all signs of possible dental disease. Start by having your dog’s teeth and gums examined and professionally cleaned this should become part of your regular vet exam. You can keep teeth fresh and bright with in between cleanings at home. Brushing at home with special tooth paste designed and formulated for pets. Make it part of your regular grooming. A good thorough dental cleaning and regular brushing at home is going to improve your dog’s teeth and breathe. Dogs do not naturally have bad breath. If you need help ask you vet for a hands on lesson in how to provide the best home dental care and for suggestions for special dietary aids to help keep your dog’s teeth and gums as healthy as possible.